So Many Words: A Fun, Full Weekend! I can't remember having a weekend this wonderful in a LONG time! Friday night, Grant and I braved the long lines and saw the 9:30 showing of the new Batman movie. Man oh man! That movie was INTENSE! It was really quite wonderful. I do feel like it was about an hour and a half too long, and a little too dark for me, but, it was beyond impressive. It is absolutely a must-see. Also, this happy-go-lucky girl prefers a perfect, over the rainbow, smiley, kissy, peace on earth ending to a movie, which this one did not produce. But still, for what it is, I REALLY enjoyed the movie! Saturday morning I woke up earlier than normal.... cause I had somewhere to be! My twin nieces and my sister Shannon were in from Austin and staying at my parent's house. I hadn't seen the girls since May and drove over to my mom's as soon as I finished getting ready. We were giggling when we got there... my mom keeps some pretty wooden dolls on her fireplace (3 girls)..... and apparently Scarlett or Juliet thought that those girls needed to be in time out. They were facing the wall. Naughty, naughty wooden girls!! My mom, Shannon, the twins, and I spent the morning at the mall! Scarlett and Juliet really wanted to ride on the big carousel! They had to wait their turn though, and they did so very very patiently. Here are the girls watching the carousel with wide eyes.... wanting so badly to be on it! Scarlett was saying: "It goes up and down! Up and down!" I love this picture of Jules! Aunt Jen and Jules on the carousel (at last!). The reason that Shannon and her girls were in was because my dad had bought ASTROS tickets for the whole fam a few months back. The Astros are very near and dear to my heart. I grew up going to those games. This was my first game to go to this season, and also, my very first Astros game ever in my entire life that did not involve Craig Biggio, my boyfriend. However, my second boyfriend, Brad Ausmus is still on the team, so I felt better. Plus I had a hot dog which was AWESOME. Here is our brick outside Center Field. When the park was being built, my dad had the Martin family etched onto a brick. He did this before any of us got married (I think Jaclyn was engaged at the time). I really appreciate how this is the ONE time in LIFE that my name is at the top, not the bottom of the list! 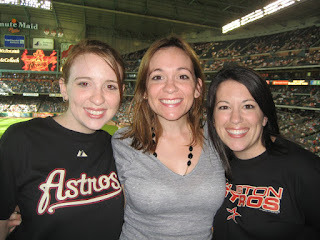 My beautiful sisters and me at the Astros game. We had SO much fun! Grant LOVES to take pictures. It was a shining moment for me. Sunday morning, we woke up, cleaned the house, and headed off to church, where Pastor Gregg once again preached an excellent sermon, finishing off the 10 Commandments. Our friend David joined us for church and then afterwards for some lunch at Goode Co. Barbecue. YUM!! After church I did my grocery shopping and then Grantley and I decided to take a little nature walk. We went to the Houston Arboretum. It was very peaceful and serene. Moxie REALLY loved it! Sweaty people on a nature trail. This was a pretty butterfly that was rather attached to Grant! Love ya'll, have a wonderful week! Great post! We had so much fun seeing you. Thanks for documenting it so well. I was so impressed that you woke up early to come see us! A hot dog is waiting for you in Austin..